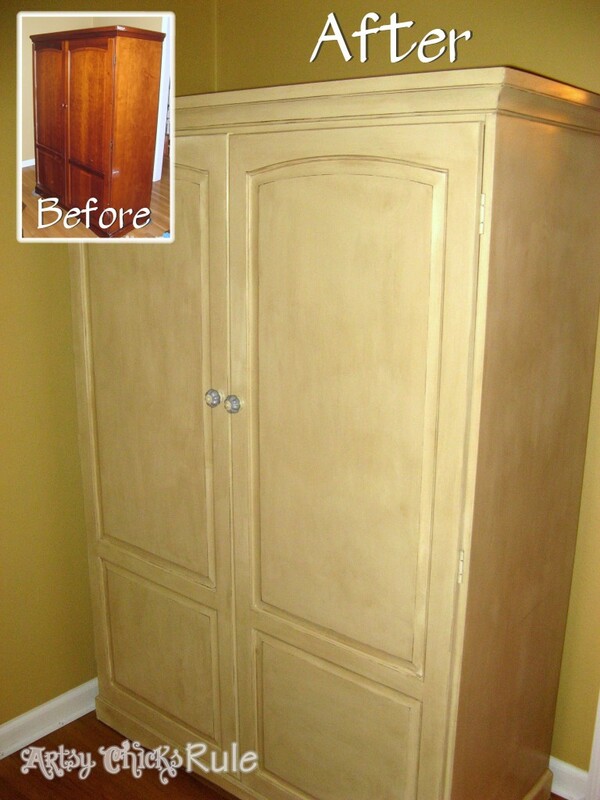 Painting, refinishing and giving makeovers to furniture is so rewarding! Before & after furniture transformations are my favorite. 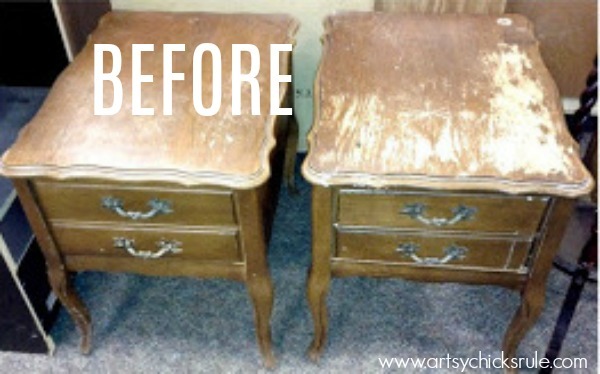 These before & after furniture pieces are some of the early makeovers here on the blog. I actually didn’t do any tutorials for these pieces but do give what I used for each makeover. So, just a nice collection of fun before & after furniture photos. That’s the best part of it anyway. The transformation. 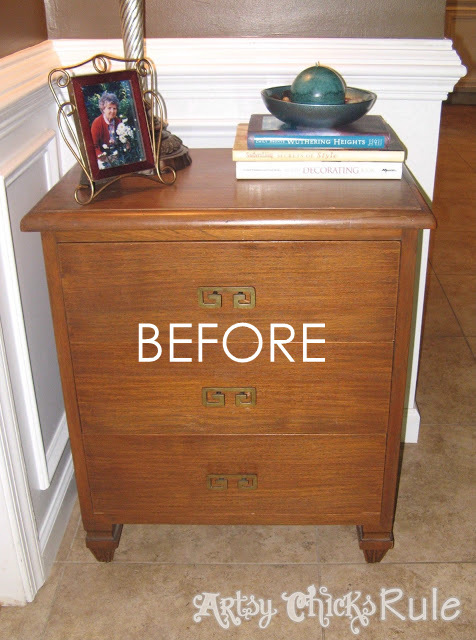 I don’t know about you but I just love looking at before/after furniture photos…one of my favorite things to do. It always amazes me how different things can look with a little paint…or pretty new, fresh stain. I sanded the tops completely down. I then used a very dark stain on the tops (Rustoleum Kona) finishing up with Minwax Wipe On Poly in Satin. It’s hard to tell in the photo but you can see some wood grain. The paint on the base is a blend I came up with mixing some white (Sherwin Williams) and a small blue sample (Valspar). I made a darker and lighter version and layered them to get the effect. Darker underneath with the lighter on top. I sanded back to let the dark show through in places. I then distressed and added a glaze..brushing on and then wiping most of it back off. I love how this finish came out! I dry brushed the handles in the same paint and then sprayed them with Minwax Polyacrylic to protect them. They went to live with my wonderful sister in law and look great in her guest room. This sofa table was painted in a blend of Antibes Green & Pure White with a dash of Graphite– all Annie Sloan Chalk Paint. I finished this one by distressing a bit and using Clear wax to seal. This one came from a garage sale for $7. I don’t often use green these days but maybe I should give it a go again! This is a jewelry armoire that my mom bought me quite a few years ago. 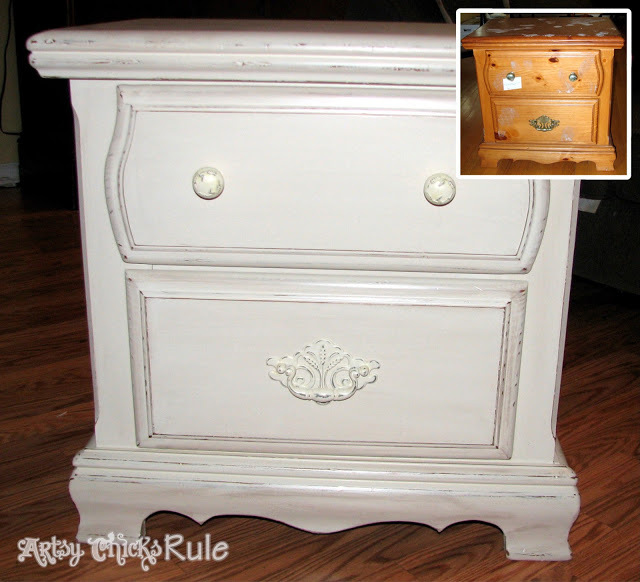 I was tired of the oak-y color so painted it in Antoinette Chalk Paint. I used a blend of clear and dark wax for this one to finish it up. 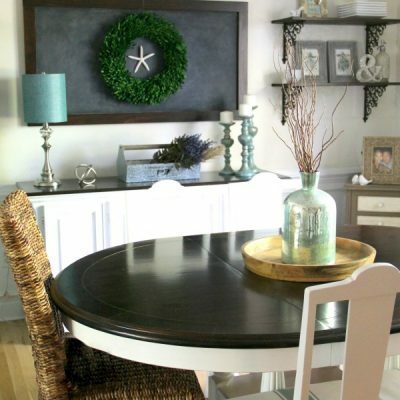 I painted this one in Old White and a blend of Antibes Green/Old White – all Annie Sloan Chalk Paint. I sealed this one with Minwax Polycrylic. I had stenciled the fronts of the drawers originally but ended up not liking it. 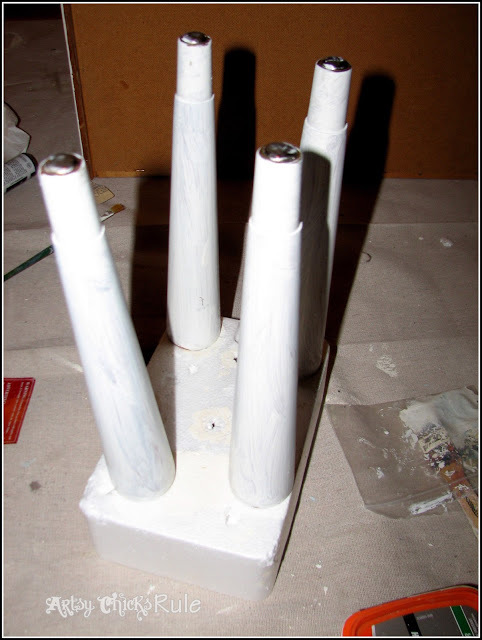 So I painted over them and dry brushed the white over the green as you can see below…..
And here’s a little tip…..
Use old styrofoam to paint knobs and such. 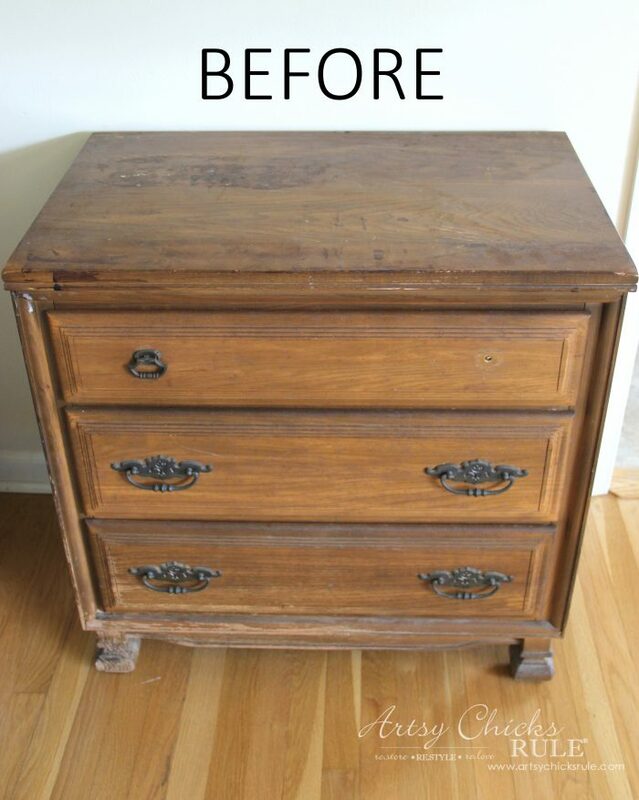 This worked very well for painting the legs on this dresser. And another tip…I wrap my brushes in plastic wrap or zip them up in a little baggy (like above) while I’m waiting to paint consecutive coats. This one is painted in a blend I made from Sherwin Williams paint. 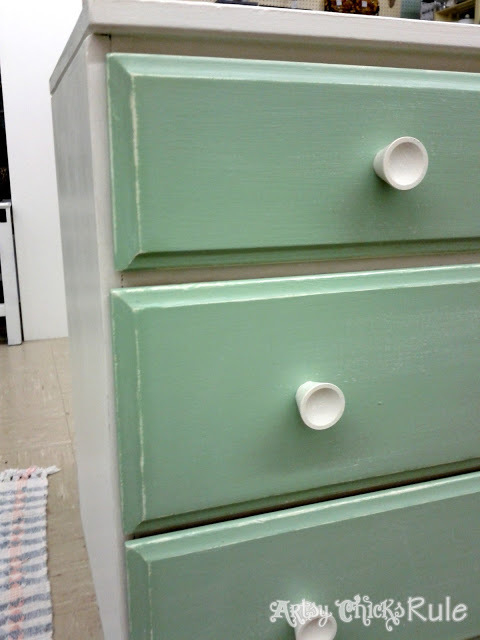 I actually painted the handles in Old White Chalk Paint since they were metal. 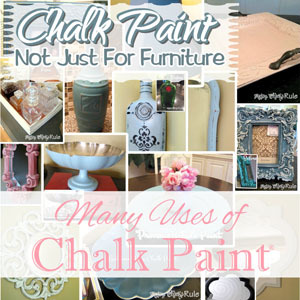 Chalk Paint works great on metal! I finished it up with some distressing, a little glaze and Minwax Polycrylic. I got this nightstand at the thrift store for $10. I’m actually working in the garage here…surprise of surprises, I know. I’m always painting in my house, it seems, in all of my photos. You know what this little cabinet is sitting on?? Have you ever had one of those pieces that you painted and then decided, oh no, that’s not right? Sooo…this one was pretty in that turquoise shade. I don’t remember what I used, it’s been awhile…I think it was Napoleonic Blue, Aubusson and Old White mixed, most likely. BUT when I originally painted it that color I didn’t take into account the color of the coffee server I had done for the same room in this post here. Probably because I hadn’t found the dresser ….. or painted it yet.…at the time. 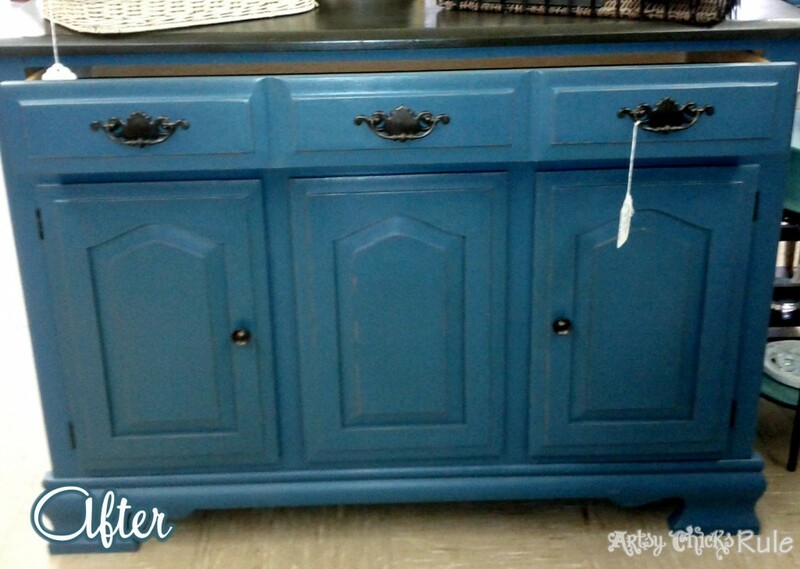 Once that was done….in the lovely teal shade that it is…this little cabinet just looked ridiculous in the same room. So thinking I wanted to bring some “coral” into the room, I painted it Scandanavian Pink…also Annie Sloan Chalk Paint. It’s a lovely Salmon-y color. Nope, it was the WRONG color as well, for this room. Well not really the wrong color….just too much of it. One colorful focal piece is all you need in a room, trust me on this. The creative process is so fun sometimes!! 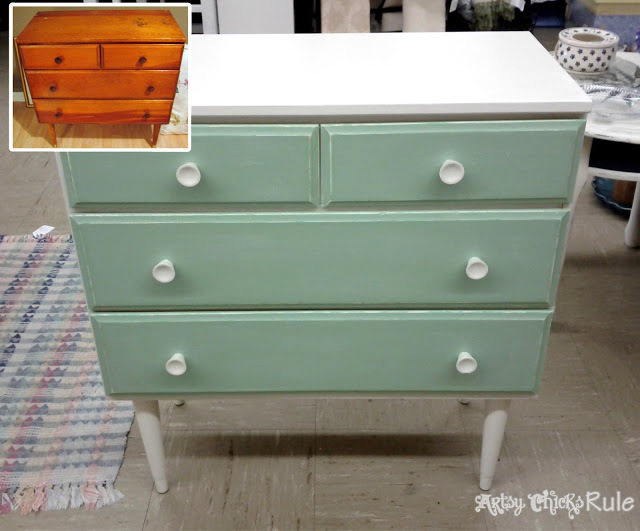 I believe it stayed that color all of about 10 minutes and I was on to Coco Chalk Paint. Coco is a nice, neutral beige-y/cocoa/brown color. I coated it heavily in dark wax after to darken the color even more. That was such a fun painting day. Yeah…. No. 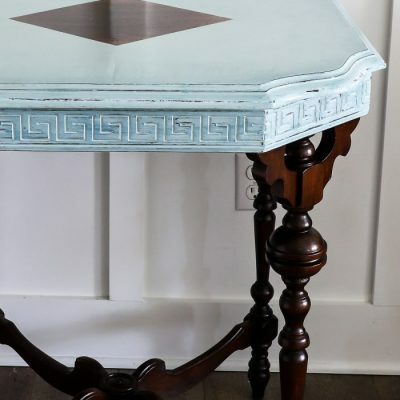 Can I just say how glad I am that you can paint right over the finished wax with more Chalk Paint?? Very glad. So this is how it ended up and I love it. And it’s still this way, many years later. This little “file” cabinet holds our cable modems, etc, over in the corner of the dining room where the outlets are. Since we are staying here for a few more years and redoing so many things. This is on the list. It’s time for these outlets to come out of this room. We are planning to move them to the family room in the far corner by the raised bar top/kitchen. Basically, completely out of the way! I can’t wait to empty out this corner in the dining room. Poor little thing went through 3 colors before I got it right. Oh and that small piece of furniture was the most expensive item in this post and more than I usually spend on something that size. I had been searching for awhile for something to “hide” all the junk associated with the modems and this fit the bill. It’s wonderful that it all fits so nicely in the drawers not to be seen again! 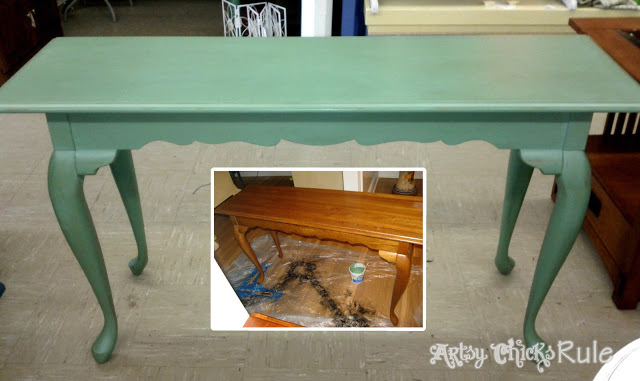 I’ve actually repainted this desk again since originally writing this post. It was a little too yellowish and I decided to use Pure White Chalk Paint on it to brighten it up. You can see it in this post, here. Same color as the desk, with clear wax, and then dark wax applied to seal. 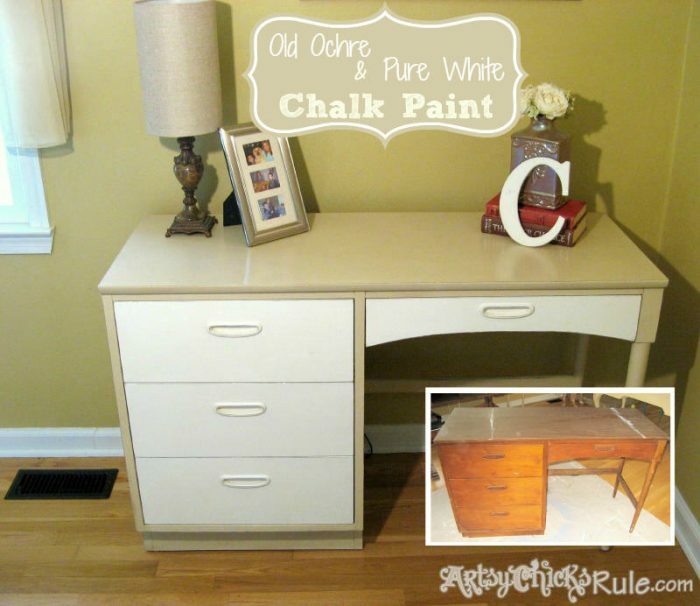 This $5 retro desk got a new lease on life with a little Chalk Paint too…. Old Ochre and Pure White. Great combo, really. Also, that top is slick laminate. 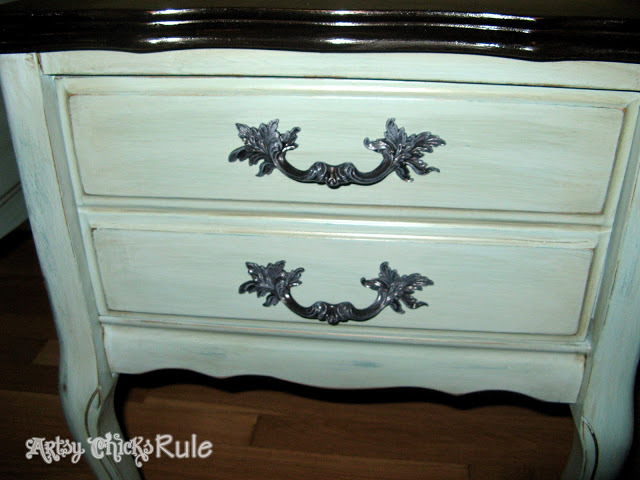 I simply sanded it lightly and painted on the Chalk Paint. 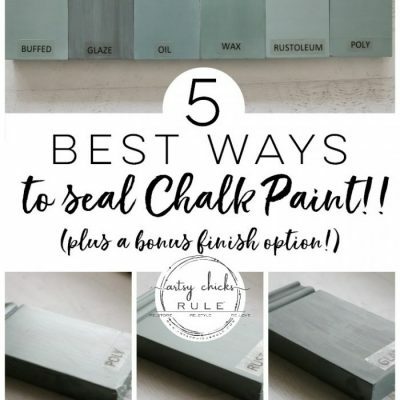 Chalk Paint works great for this but…you do need to sand a little. And instead of sanding and/or staining the top, I decided to paint it with Graphite Chalk Paint. The whole thing got a coat of clear wax to seal. The hardware got a spray of Oil Rubbed Bronze. I loved the blue/black combo on this one. I found it at the thrift store for $10. A steal. Can’t find em like that these days! 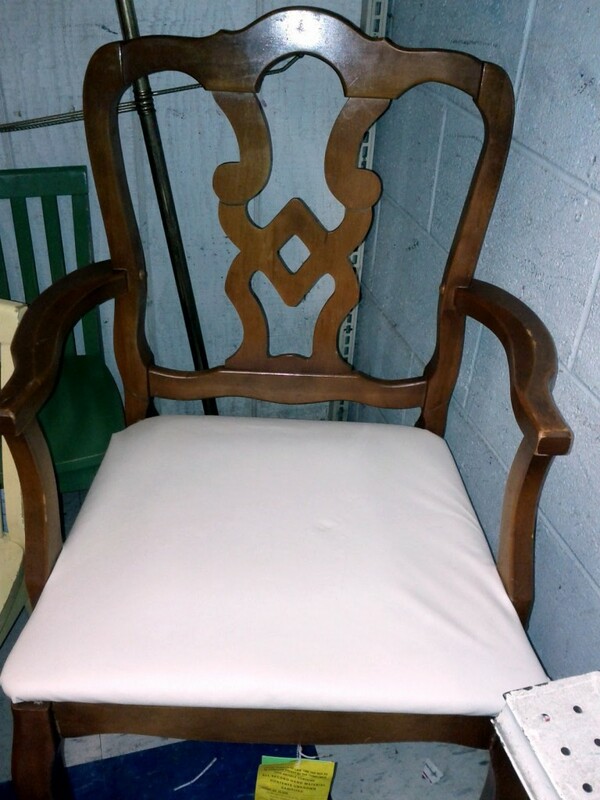 And lastly, this $5 chair I found at the thrift store …. 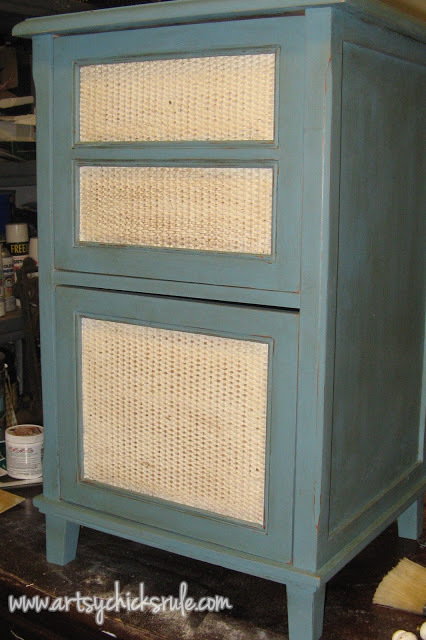 I used Aubusson Blue Chalk Paint on this one, too. And gave it a new look with new fabric for the seat. And I have to mention my sweet, sweet Lexi girl sleeping on her bed there beside the chair. 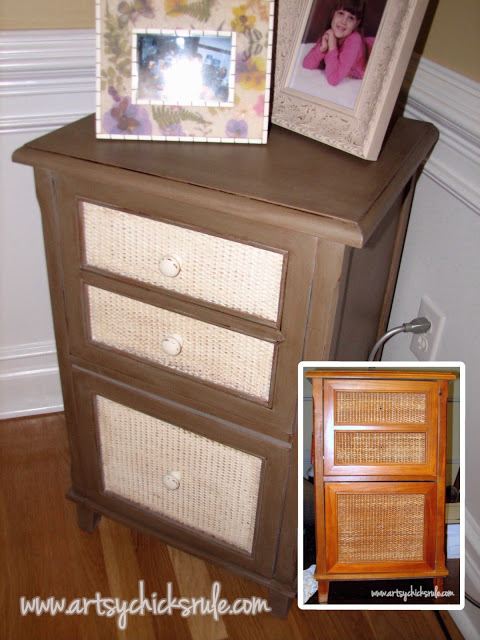 I hope you enjoyed this small collection of some of my old before & after furniture pieces. 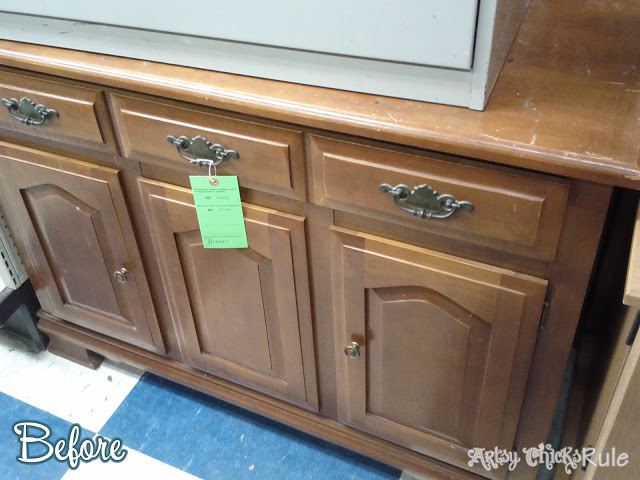 Do you want to see even more painted/refinished furniture? 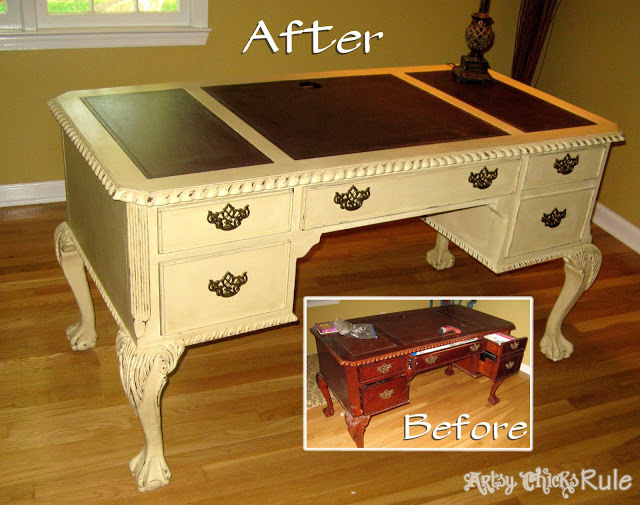 Then you might like this post with another collection of makeovers, mostly with stain. 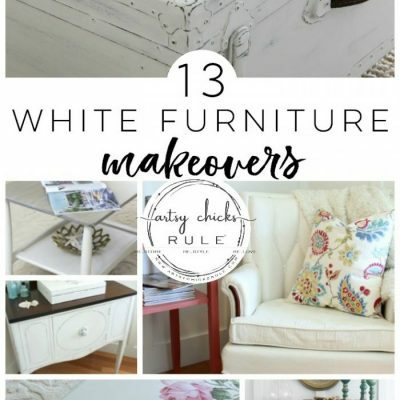 See this post and furniture makeovers, here. They all look wonderful! 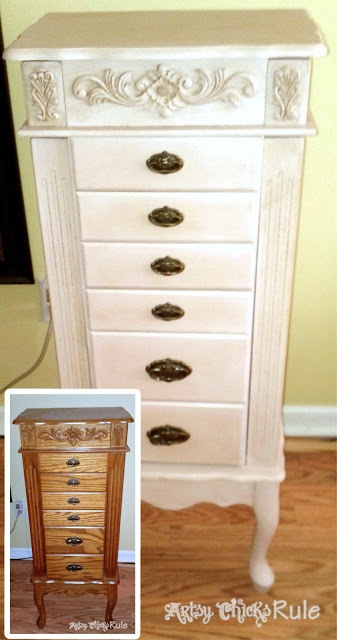 My favorite is your jewelry armoire – gorgeous! You rock, I adore it! Love your transformations! I finally figured out that my attempt to follow you by email didn’t go through so I just joined through Google! I kept wondering why I didn’t see any posts!! sheesh…. I’m good now! Great job! You’ve made some beautiful transformations there! Have a great day Nancy! Nancy!!! These are gorgeous!!! I so think you need to open an etsy shop to sell some of these!!! Your work is outstanding!!! I will be coming back to some of your techniques because I hope to do a couple tables for my girls room!! Have a great week!! Thanks Nicole :) I wouldn’t even know where to begin on Etsy or shipping furniture but I have thought about it actually…fleetingly!lol. Thank you for the sweet words. :) Hope you have a fantastic week too! Thank you Anna :) and thank you for the follow! Hello, I’m a new follower. I love your blog. You’re very talented. I hope you will visit my blog and maybe want to follow back. Thanks for following! :) And thank you so much for the kind words. These all look fabulous!!! I know you are excited about the move to WordPress!!! 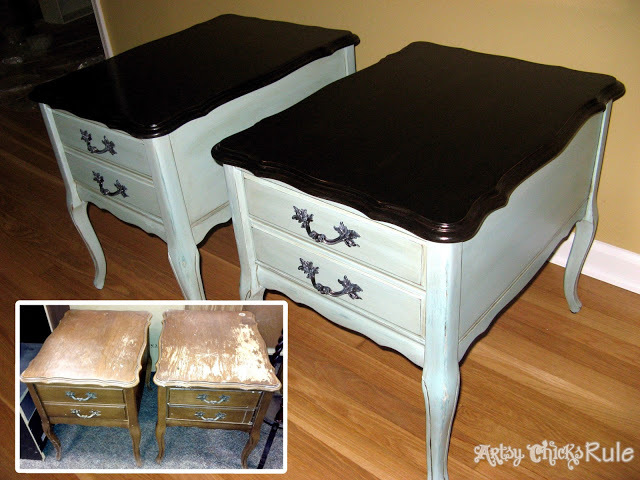 Your furniture transformations are awesome! Thanks so much for sharing such great inspirations! 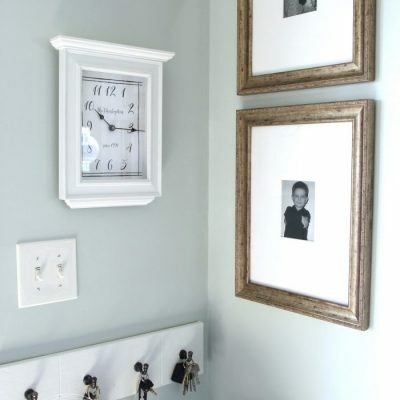 These are great pieces and you are one busy lady. : ) By the way, you said you used Minwax Polycrylic on the dresser, did you have any issues where it turned the top yellow? 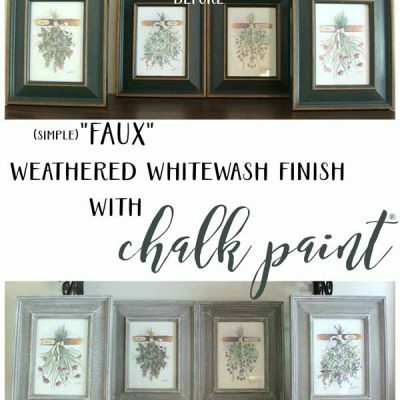 I have heard when using light chalk paint it will turn yellow even if you use non-yellowing. What’s your take? Thanks. Hi Vanessa! I have painted quite a few pieces with it and Old White or Pure White…I have not seen that issue so far. I will keep a lookout for it and will update if I find that it does. Nancy, they all look so nice. You do such nice work! These are beautiful! I especially love the aqua one. Thank you for sharing—they are truly inspiring! Thank you Melissa! :) Yes, that is probably my favorite of this bunch too! Haha…. Thanks Tanya! ;)Some of them are pitiful when I start!! “The Queen of Restoration” that what we should call you Nancy…lol, they’re all look great compared before. It was really fun to see the before and after photos. You inspire me so much! There’s some really beautiful pieces there, Nancy! Some, I don’t remember even seeing before! And I thought I had been through your whole blog at one time or another! Please tell me how you treated the leather top of your desk. Did you restore it with something? I have a desk with a leather top and am trying to figure out what to do with it. I actually just painted right over it. It was scratched and worn and not the color I wanted it. I used brown Chalk Paint. 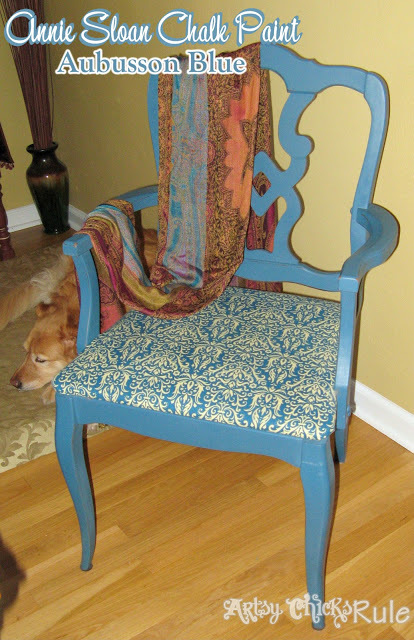 The Aubusson Blue that you used on the $5.00 thrift store chair, is that 100% Aubusson Blue or did you add a white chalk paint to get it that color? I love it, by the way! Thanks for the quick reply, Nancy. Wondering what you painted the leather on the desk with? I just got a desk at goodwill with the exact same top but it is damaged and I need to paint it. Love the desk!